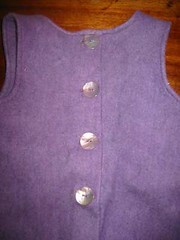 button detail from back of ottobre dress. they’re curved, in a purple mother-of-pearl type finish and nicely oversized. fab. (will post the bad and the ugly later when the camera battery’s recharged.